The other week, I pulled a sentence at random out of John Crowley’s classic Little, Big . I used it to illustrate a point about narrative voice, but a couple of days later I had an epiphany: the same sentence can also illuminate pacing and a story’s emotional flow. When I was a kid, I spent just about every waking moment building adventures out of Legos. Back then (despite my fiancée’s assertions, dinosaurs did not roam the earth), Legos lacked variety. There were blocks…and blocks. A handful of different sizes, and that was about it. But despite their limited palette, I could tell just about any story my five year old self could imagine using those blocks. I built castles, and spaceships, and horses, and windmills. Fantasy, science fiction, monsters: I was only limited by my imagination. Fast forward a few years, and you’ll still find me playing with building blocks. Only now, I use words, sentences, and paragraphs to tell stories instead of little plastic bricks. At its most basic, a story is composed of letters. Those letters build up words, which in turn comprise sentences, then paragraphs, then chapters, then acts, then books, then series, and so on. 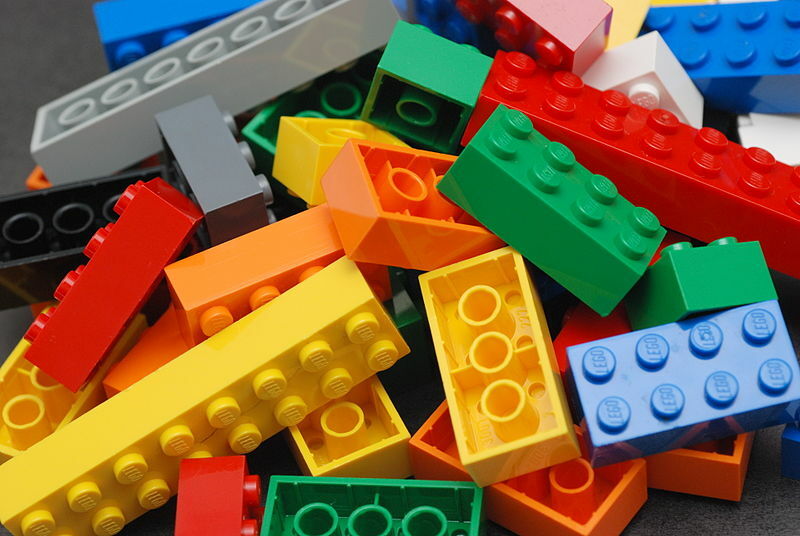 But those letters are not necessarily our story’s real building blocks: instead, think of them as the long-chain polymers that make up our true Lego pieces. And the specific mix of Legos will differ across stories and media. It’s easiest to see these building blocks at work in visual media like sequential art (comics, graphic novels) and film. Some people might argue that dialog is key to these media, but I disagree. Dialog doesn’t frame the story: dialog is what gets framed. For sequential art, Scott McCloud1 and Will Eisner2 both explained brilliantly how the page is the medium’s real building block. Each page is composed of one or more panels that depict some action occurring in time. The composition of each panel and its relationship to others on the page establishes tension and moves us from one state to another. The page frames a finite emotional progression, while the panels that make up that page control our sensation of time (the story’s pacing) throughout the journey. The same paradigm works for film. A screenwriter’s scenes function the same way as a comic book page, where each scene represents a finite emotional arc through which the audience and characters travel. Each scene takes us from an initial point A to a subsequent point B, and the director uses one or more shots to get us there. Shots structure and control the flow of time and tension throughout the encapsulating scene, just as sequential panels structure the flow on a comic book page. Visual media impose structural constraints by their very nature, which helps make their building blocks easier to spot. But when writing prose, those constraints go right out the window. The structure of our prose affects how we perceive the flow of time. Hemingway’s short declarative sentences communicate speed. Proust’s meandering sentences, with their convoluted clauses and tangential commentary, establish a more laconic feeling. Short paragraphs and short chapters read faster than longer ones. But it is their relationship to emotion that determines the real pace of the story. Even the utilitarian sentences that describe an almost-incidental action contain an emotional arc. If Little, Big is composed of Legos, then they are sentence-shaped. The sentence length, structure, punctuation, and emotion-laden words control the story’s pace. Each sentence demands that we pause and savor what it has done to us. Without those miniature emotional arcs, the text would be meandering, dull, and lifeless. But by employing brilliant tricks of emotional association, Crowley’s manipulation of our emotional state becomes transparent and, like Smoky Barnable, we find ourselves enraptured in the liminal fairyland of Edgewood. As the wood grew first thinner and then smaller with distance, he could see the sunlit slopes beyond it and above it; and across these was still moving the square black mob like one monstrous beetle. In the very strong sunlight and with his own very strong eyes, which were almost telescopic, Syme could see this mass of men quite plainly. He could see them as separate human figures; but he was increasingly surprised by the way in which they moved as one man. They seemed to be dressed in dark clothes and plain hats, like any common crowd out of the streets; but they did not spread and sprawl and trail by various lines to the attack, as would be natural in an ordinary mob. They moved with a sort of dreadful and wicked woodenness, like a staring army of automatons. Syme’s laughter at all this had about it a wild weakness of relief. He laughed at the idea of the paralytic Professor being really a young actor dressed up as if for the foot-lights. But he felt that he would have laughed as loudly if a pepperpot had fallen over. At first the large stone stair seemed to Syme as deserted as a pyramid; but before he reached the top he had realised that there was a man leaning over the parapet of the Embankment and looking out across the river. As a figure he was quite conventional, clad in a silk hat and frock-coat of the more formal type of fashion; he had a red flower in his buttonhole. As Syme drew nearer to him step by step, he did not even move a hair; and Syme could come close enough to notice even in the dim, pale morning light that his face was long, pale and intellectual, and ended in a small triangular tuft of dark beard at the very point of the chin, all else being clean-shaven. This scrap of hair almost seemed a mere oversight; the rest of the face was of the type that is best shaven—clear-cut, ascetic, and in its way noble. Syme drew closer and closer, noting all this, and still the figure did not stir. Taken individually, the sentences are utilitarian. Most are solely descriptive, with no emotional imagery employed to direct our mental state. Yet in each paragraph, certain imaginative descriptions are employed with laser precision to manipulate our emotions (a “staring army of automatons”, “wild weakness of relief”, or “deserted as a pyramid”). Each sentence is just a sentence, but with his paragraphs Chesterton increases and decreases tension like a sound engineer mixing in a recording studio. Still other authors use scenes or whole chapters as their basic building block. While I won’t quote entire chapters here, I recommend taking a look at how Steven Erikson or Yasunari Kawabata manage it (particularly in Gardens of the Moon and The Master of Go , respectively). So enough theory: what practical conclusions can we draw from this? If each story has a set of natural building blocks, then we have to identify it. The set will depend on the story’s medium, its audience, and the emotions we want to evoke. I suspect a spy thriller is unlikely to use sentences as its building blocks: to get an emotional response from individual sentences would slow the action too much to work within spy thriller conventions. By contrast an introspective memoir might luxuriate in the kind of sentence-level emotional manipulation that Crowley executes. While this may just be my own idiosyncrasy, I find that once I know what the basic building block of a story is, it becomes much easier to write. If I know that I start a [sentence / paragraph / scene / chapter] at emotional point A, and need to get to point B by its end, the amorphous task of writing becomes easier. It’s not just a question of knowing where to go: that’s just plotting. Instead, it’s grokking the space I have to operate in. While I’m not a painter, I imagine it’s like understanding the bounds imposed by a piece of canvas. Within those bounds, I am limited solely by my imagination. But by figuring out which Legos I’m really using, it lets me have fun building stories. A nice summation of how different styles of sentences and description create different effects in the reader!